Scotmid has donated £4000 to the Disasters Emergency Committee (DEC) Nepal Earthquake Appeal to support those left injured or homeless by the major earthquakes in Nepal in April this year. Ten staff from Scotmid skied 8,848 metres, the equivalent height of Mt Everest, at Snow Factor in Braehead, to raise funds for blood cancer charity Anthony Nolan. Scotmid pledged to match all funds raised, to be donated to the DEC Nepal Earthquake Appeal. Scotmid’s Neville Muir, who organised the event, said: “We’ve taken part in the ‘Everest Challenge’ for the last two years because it’s a fun and different way to raise money for our charity of the year. Following the earthquakes in Nepal earlier this year, we decided to do something for those people who have been affected by the devastation. 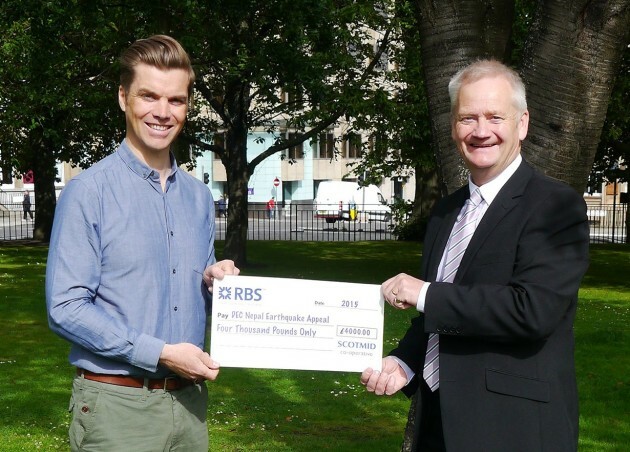 Neil Mathers, Chair of the DEC Nepal Earthquake Appeal in Scotland, said: “This is an incredibly generous donation for our crucial aid work – and a very apt fundraising challenge for a Nepal appeal! Almost £7m has been raised so far in Scotland and has made a massive contribution to helping DEC members reach well over two million people. Donations are still being welcomed on the DEC Nepal Earthquake Appeal fundraising page: https://mydonatetelethonsappeals.bt.com/donate/nepal/s2.html. The partnership between Anthony Nolan and Scotmid Co-operative – including its brands Semichem, Lakes & Dales Co-operative and Scotmid Co-operative Funeral Directors – has seen more than 5,000 Scotmid staff at 350 stores transformed into the ‘Scotmid Lifesavers’ in a bid to raise funds and awareness for the charity. Scotmid has set itself a fundraising target of £200,000 for the year-long partnership. To find out more about Scotmid’s partnership with Anthony Nolan, visit: www.anthonynolan.org/scotmid.